I love mashups and used to be a bit of a Glee fan. I would say that my taste in mashups extends to my home. My interior style is bit Boho, mid-century with a hint of rustic farmhouse. 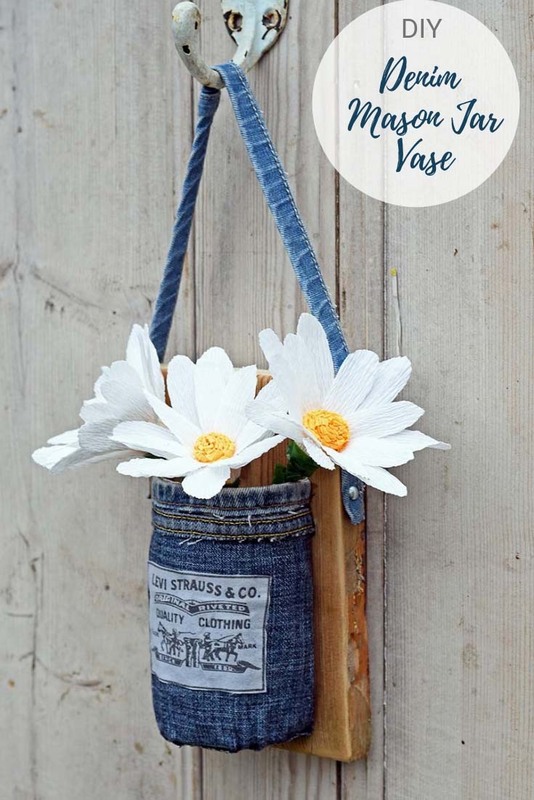 This denim mason jar vase is a mashup of crafts and upcycling. 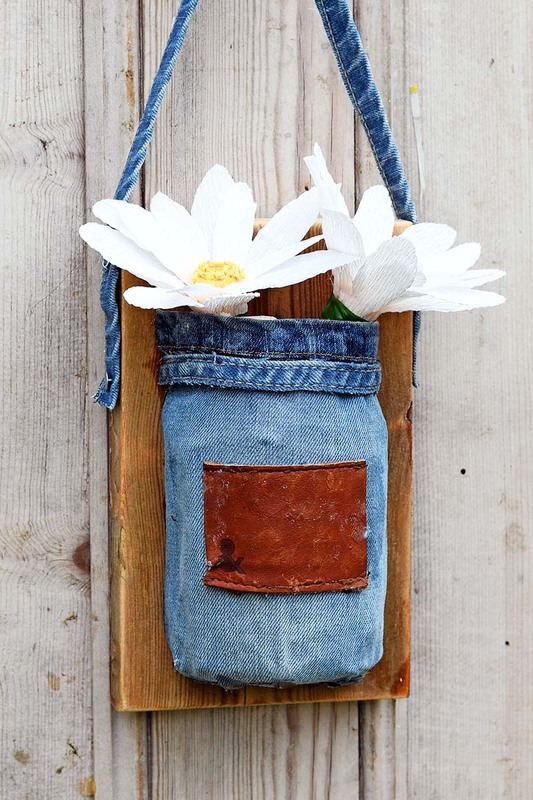 There is the upcycled element of the old jeans and floor boards combined with a mason jar craft and a bit of paper mache. 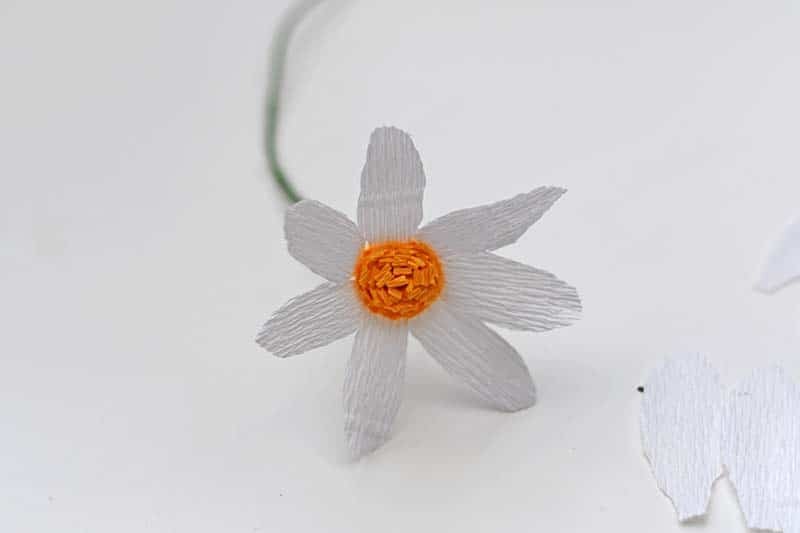 Then there are the DIY paper flowers which you could argue are a bit boho. These denim wall vases go really well with the Boho jeans pillows I made last year and the denim rug I have on the floor. The paper flowers just give the hanging vases a colourful spring feel. As with most of my crafts these hanging mason jar vases cost almost nothing to make as they were made from repurposed materials. The only cost was for the glue and the crepe paper to make the flowers. Scraps from old jeans including some seams and labels. Mason Jar – just to use as a mold. You could actually use any old jar as long as it’s the size you would like your wall vase to be. An old piece of wood – I used a cut bit of floorboard. Old newspaper and wallpaper paste. 4 small nails, cling film and a couple of elastic bands. 1. 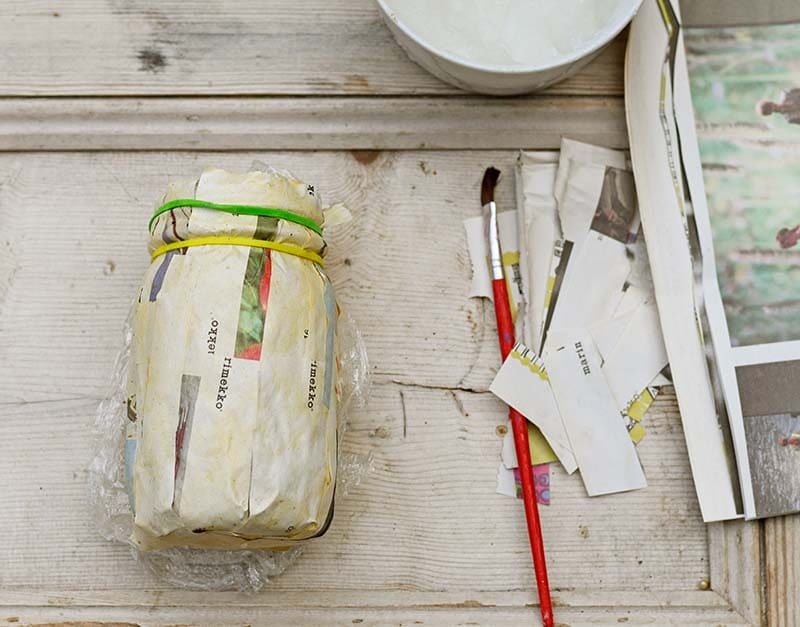 The first thing to do is to make the paper mache mason jar. 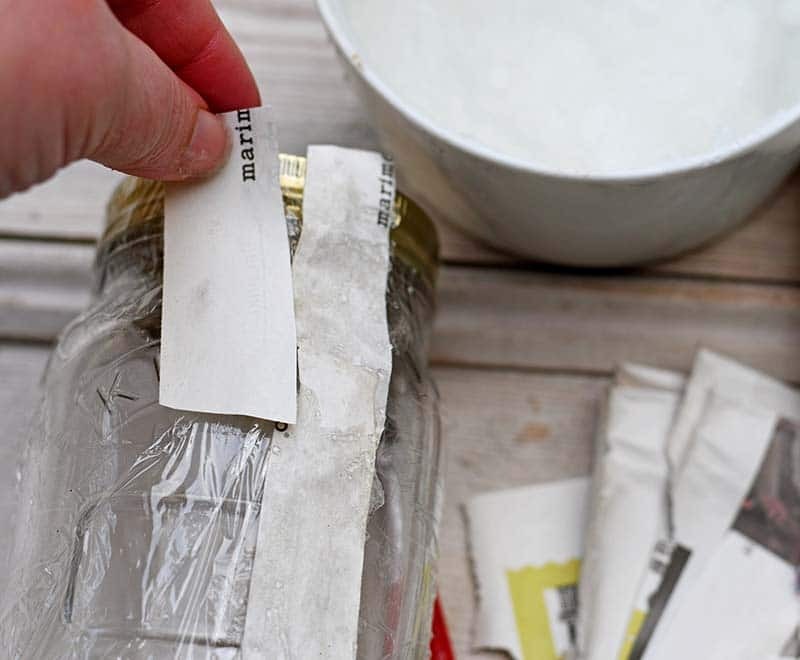 Start off by covering the mason jar in cling film (saran wrap). Then cut the newspaper into small strips. 2. 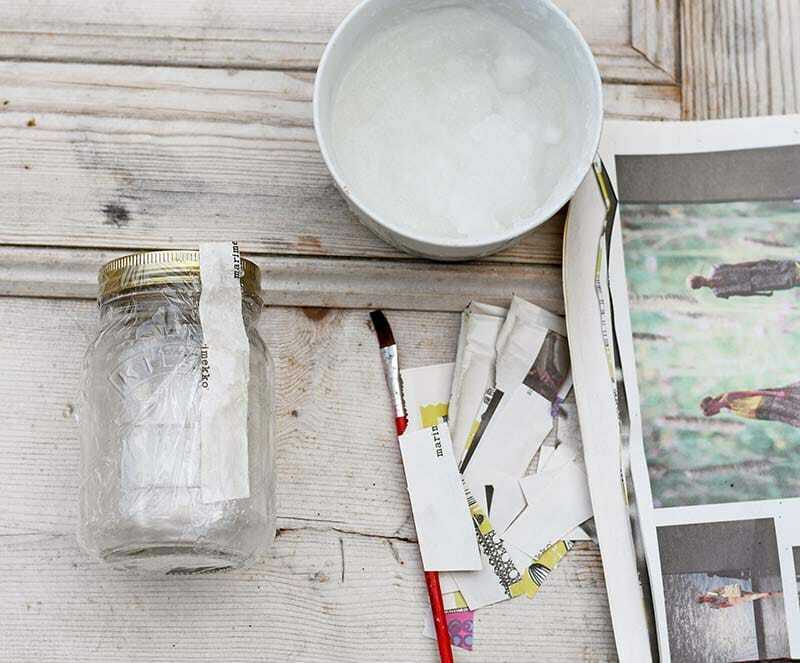 Next, using wallpaper paste stick the newspaper strips to the mason jar. Cover just half of the jar. I use wallpaper paste rather than diluted glue for paper mache as it is less messy. The paste is more gel-like and not runny like glue. I find it creates less of a mess and dries quicker. 3. You will need 2 layers of newspaper on the jar. Let the first layer dry before paperering the second layer. Also, whilst the paper is drying hold the paper at the top in place with 2 elastic bands. This will ensure that you get the contours at the top of the jar in the paper. 4. 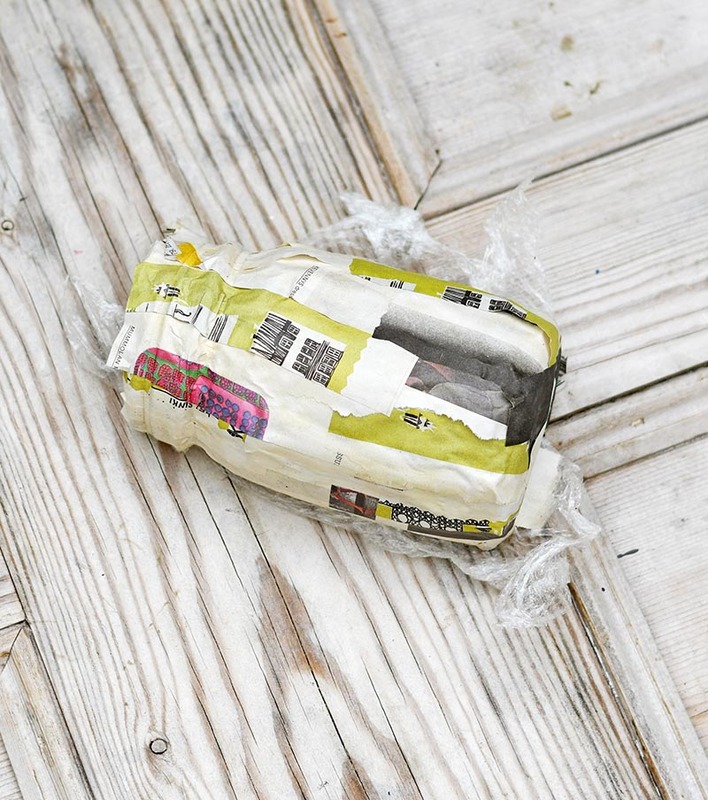 When both layers of the newspaper have dried carefully remove it and the elastic bands from the Mason jar mold. Using scissors carefully trim the paper mache into shape. It should look like a Mason jar cut in half lengthways. 5. 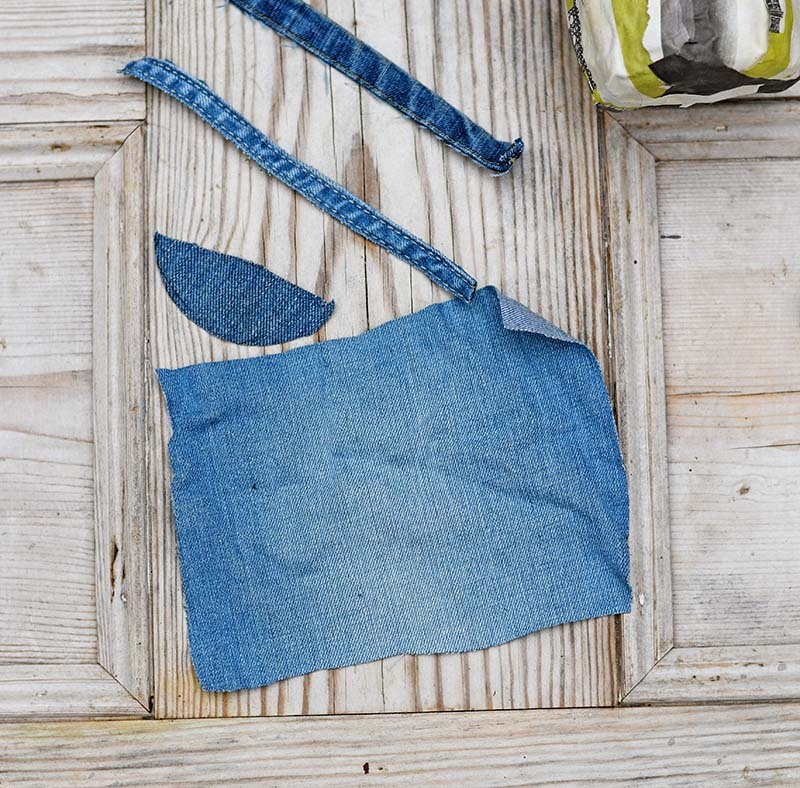 Next, cut the old denim pieces to fit the jar. 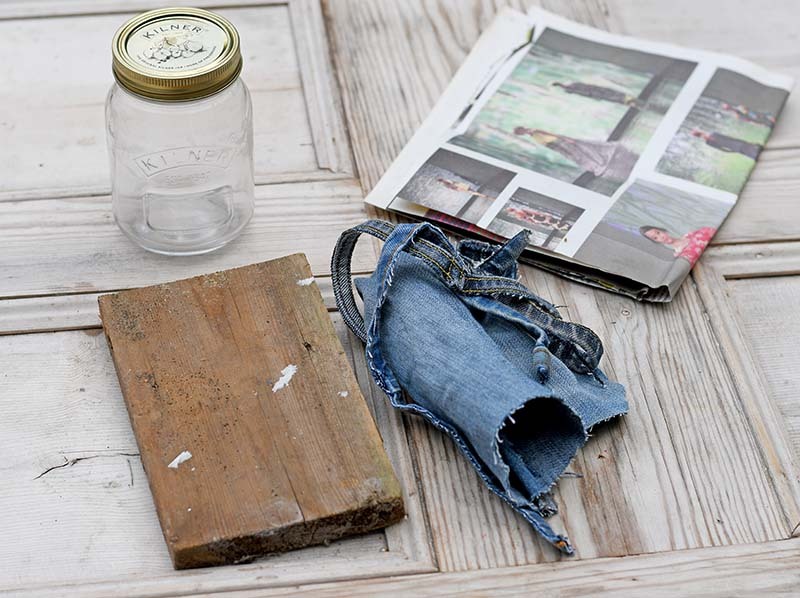 You will need one plain denim piece for the main body of the jar and another plain half circle shape for the base. Cut 2 pieces of denim seam to fit around the rim of the jar. 6. 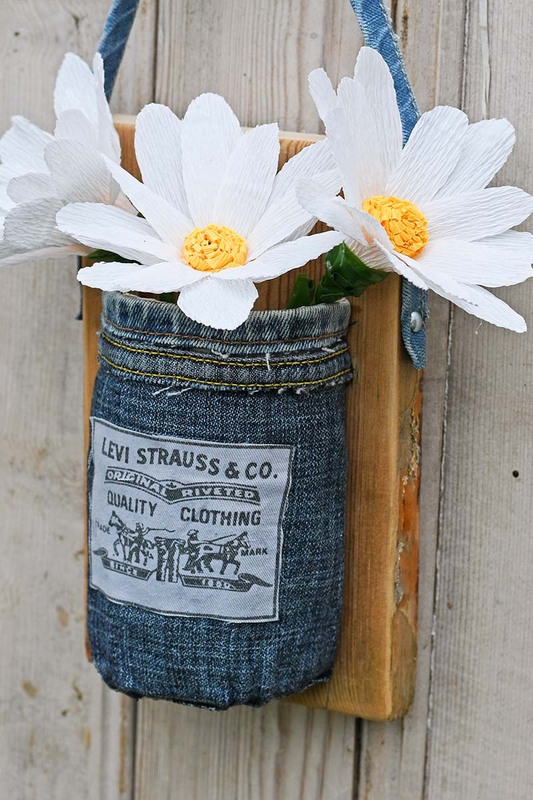 Using the fabric glue, stick the denim pieces to the paper half Mason jar vase. To add interest I also like to stick a label from the old jeans to the front of the jar. 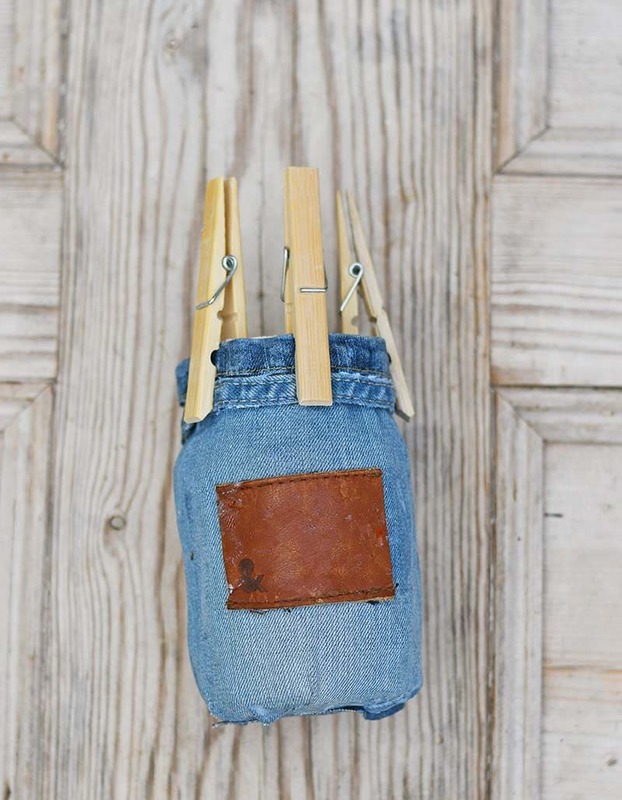 Use pegs to hold the denim in place as the glue dries, especially around the rim. 7. Firstly, cut the old piece of wood you are going to use for the backing of the mason jar vase. I used an old pine floorboard as it was just the right width. The wood also had a lovely aged look to it. 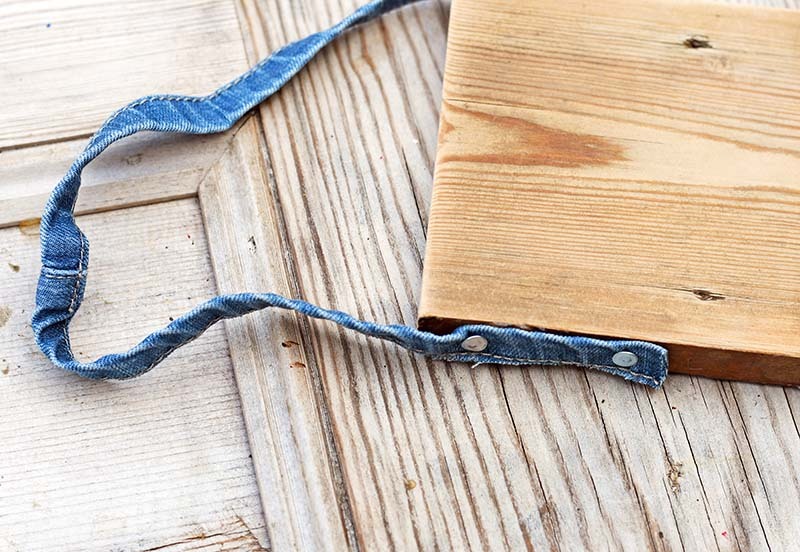 You could use a piece of pallet wood if you don’t happen to have any old floorboards to hand. Next, cut a piece of denim seam or hem about 30 cm in length. Nail one end to the side of the wood and the other end to the other side. 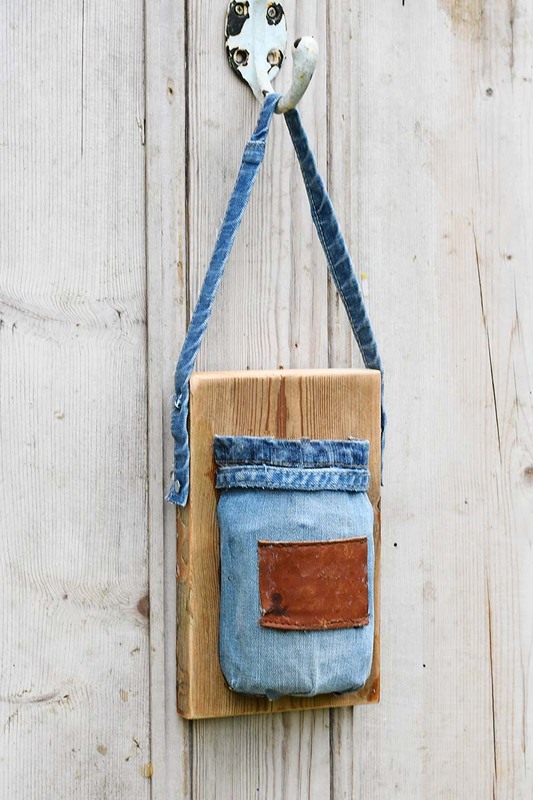 This denim seem is used to hang the mason jar vase. 8. Finally, to finish off the mason jar vase, glue the vase to the wooden board using contact adhesive. Once the glue is dried the vase is ready to hang. All you need to do is slip the seam over a hook or nail. I was so pleased how this handing denim Mason jar turned out that I made another one out of my husbands old Levis. The vase is not waterproof, so not suitable for real flowers. 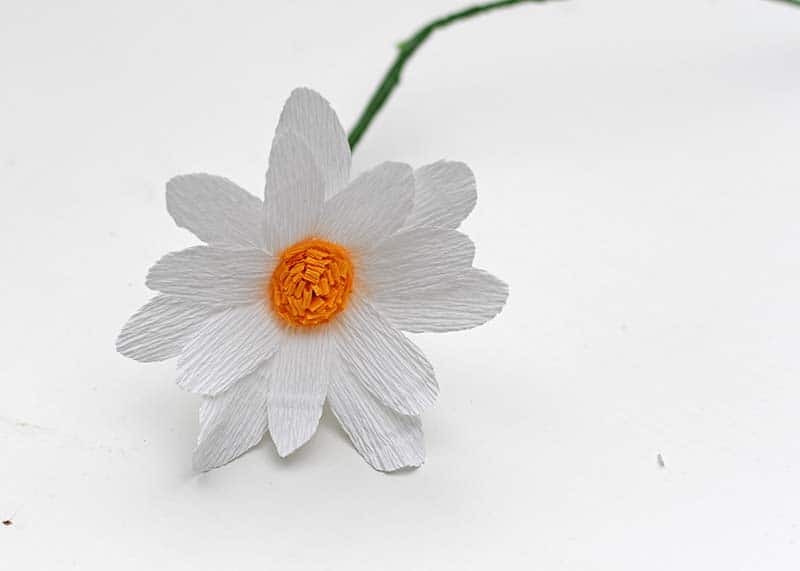 However, it is perfect for faux or paper flowers. I love crepe paper flowers so I made some for the mason jar vases. I love making crepe paper flowers. Here I show you how I made the giant daisies for this hanging mason jar vase. If you want to make other types of crepe paper flowers check out my paper flower wall decoration. 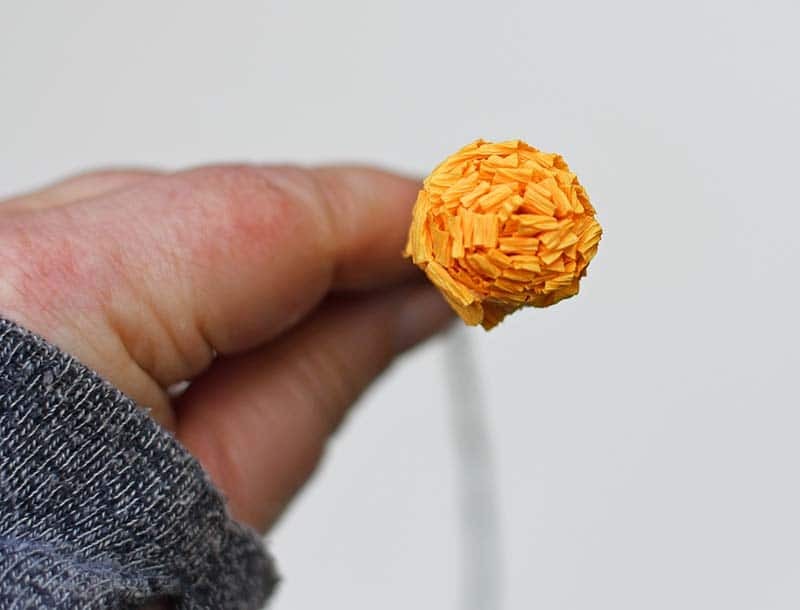 Also, sites like Lia Griffith have lots of paper flower tutorials to choose from. White and yellow Italian crepe paper 180g. Italian crepe paper is thick crepe paper that holds it’s shape when stretched and bent. 1. Cut out seven small petals and seven slightly large petals from the white crepe paper. 2. 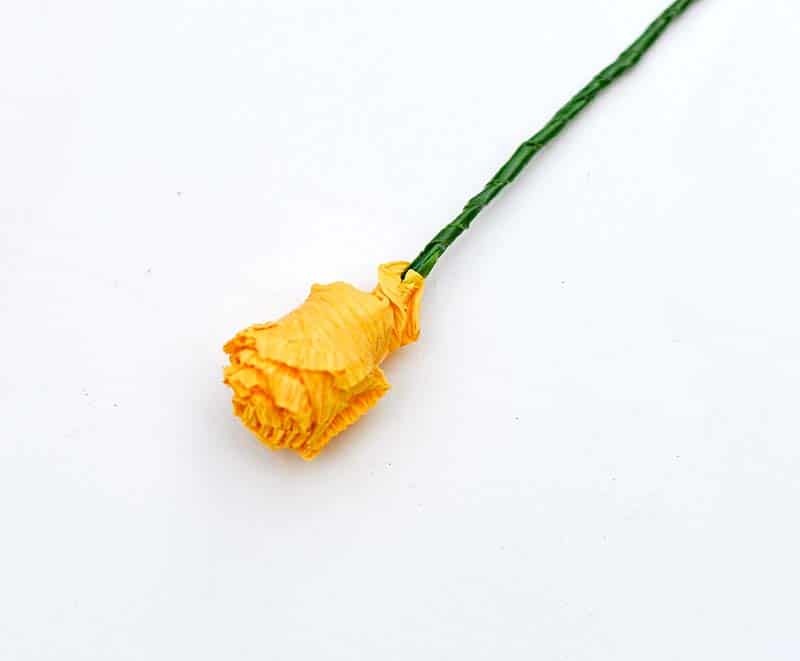 Wrap the green floristry wire around one green wire stem. 3. Cut a piece of yellow crepe paper approximately 3cm wide and 20cm long. Fold it in half length ways and cut 5-7mm slits about 3mm apart along the fold. 4. 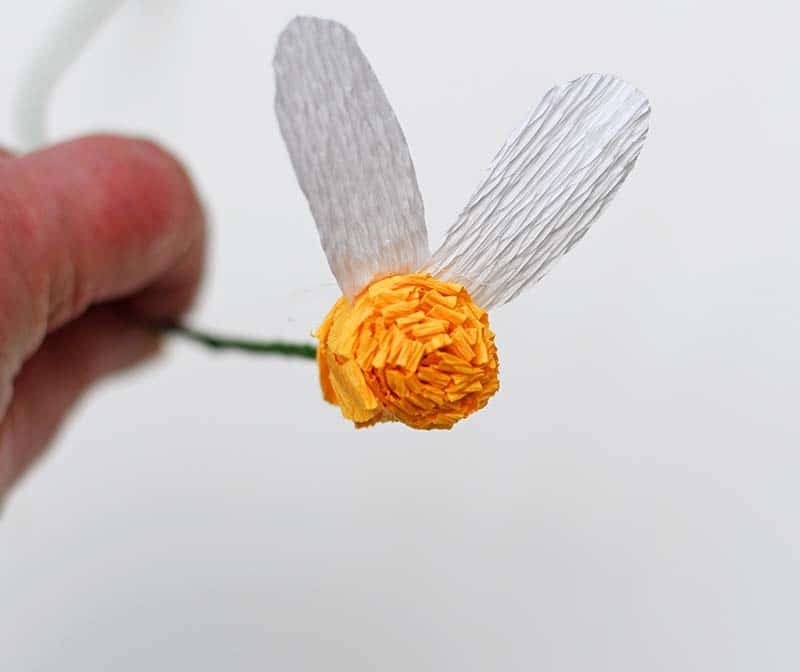 To form the center of the daisy, glue one end of the folded cut yellow crepe paper to the top of the wire stem. Wrap it around the stem and secure it with hot glue. 5. 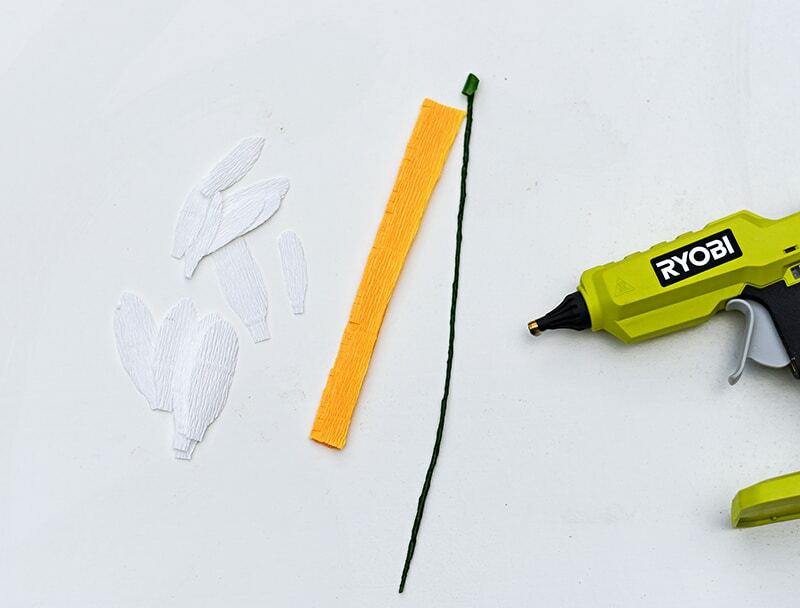 Next, using the hot glue gun glue the small white petals one by one to the yellow center. Space out the petals evenly. 6. Once all the small petals have been stuck down. Repeat with the larger petals sticking them in between the small layer of petals. Finish off by wrapping more green tape around the base of the daisy. All that is left to do now is to put the paper daises in the denim hanging Mason jar vases. 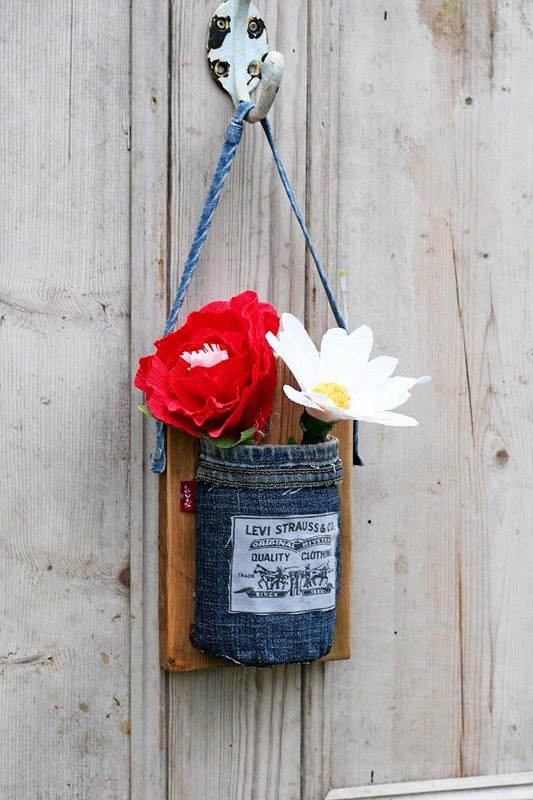 Upcycled denim wall hanging mason jar vases. Simple and cheap craft a great way to display faux flowers. Paper mache a half Mason jar shape. Use an existing Mason jar as a mold. 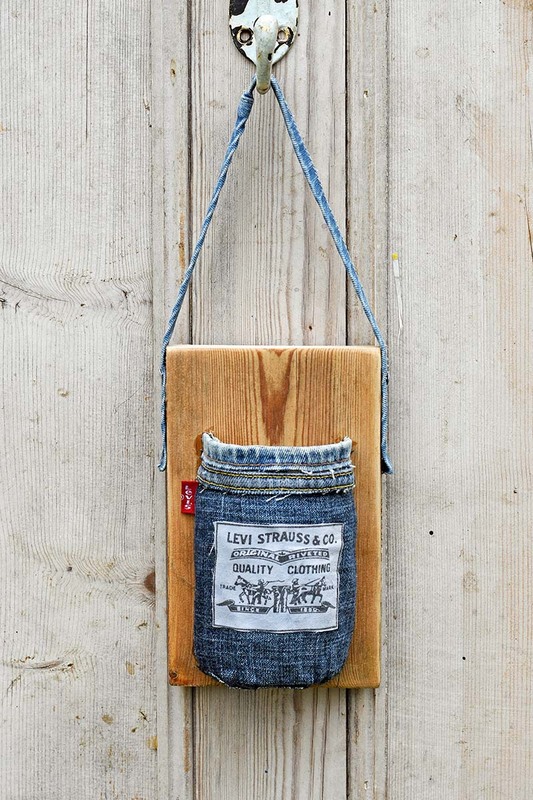 Make a hanger out of a jeans seem by nailing it to a piece of wood. 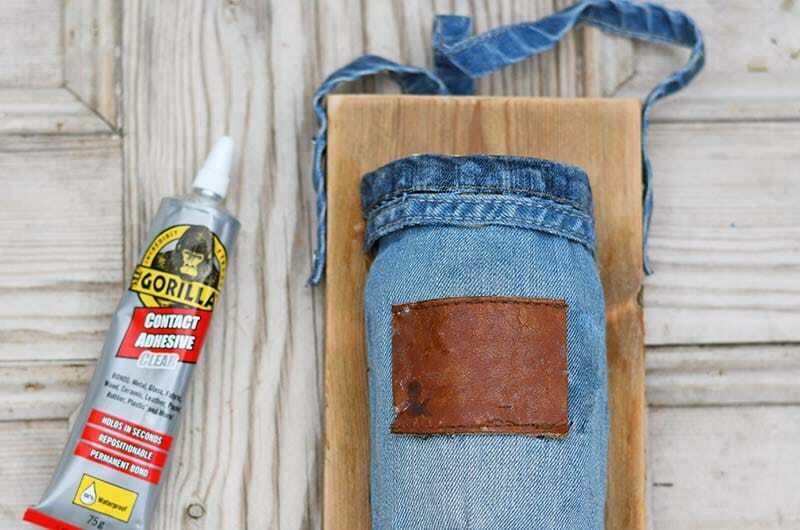 Glue the denim Mason jar to the wood. 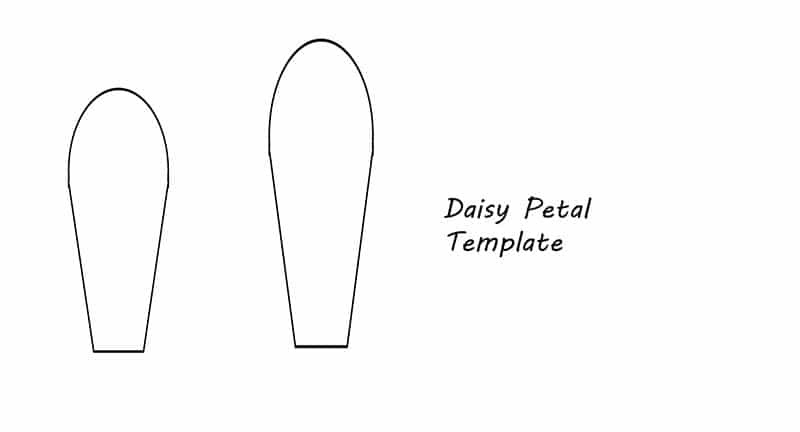 There are instructions for the paper daises on the blog. If you liked this post you might want to check out these ones too. This is so clever! You are being featured tonight on my blog for Party In Your PJs. I love this! The handmade flowers are excellent! Thanks for sharing at Vintage Charm! Great project! Thanks for sharing. Pinned. This is so cute, and I LOVE those paper daisies! Great job! I also love the idea that your home style is a bit of a mash-up. I often feel the same about my own style. 🙂 Thanks for sharing at Sweet Inspiration! Thank you so much. Yes I like lots of things that’s why my style is a bit of a mash up. Thank you, I really had fun making them. Thank you, Michelle. Cutting a mason jar in half would have been difficult but I did think about it before I came up with this idea. I do like a bit of paper mache. Thank you, Julie. Yes, the jar was just a mold. You could use a bottle or jar in a shape you like. Thank you Marie. That’s lovely to hear. 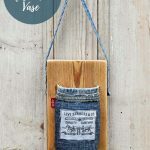 I just love upcycling denim.